Male: Cerci (pincers) 4-8 mm. Female: Cerci 3 mm; tegmina 2 mm. Male cerci vary from about half as long to longer than the abdomen, broadened basally, with crenulate teeth basally and on beginning of curvature of inner margin. Antennae: 12 to 15 segments. Color: Adults are rich reddish-brown, with wing covers and legs dull yellow brown, and the wings completely developed. Large forceps of male distinguis this species from others in North American. ~10-12 mm. However, wings are folded beneath the tegmina (leathery forewings) and are rarely visible. These earwigs do fly. Omnivorous, and both beneficial and pestiferous. 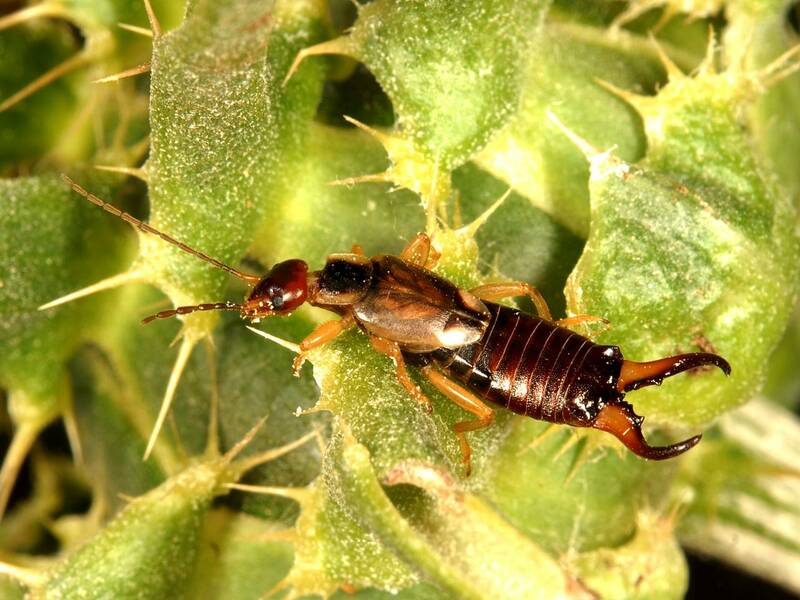 This insect will eat pests on plants as well as the plants themselves. Females lay clutches of eggs which she tends to keep clean and safe. Nymphs are miniature, undeveloped versions of the parents, with wings developing gradually on the outside of the body with each molt, the number of segments in the antennae also increasing with each molt, and the cerci develop from thin rods into the characteristic cerci of the adults. The female continues to look after early stage hatchlings. Cosmopolitan, native to western Palearctic; widely though spottily distributed across NA; introduced from Europe around 1910.